Maintain your wooden fence with these tips! Wooden fences are timeless and known for their strength and style. Installing a wooden fence on your property brings a sense of sophistication and ageless beauty. However, they do require regular maintenance to help maintain their stately appearance. What are you doing to protect your fence, or what should you add to your maintenance routine that will benefit your fence? 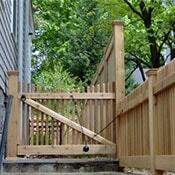 Protecting your wooden fence starts with protecting it from the elements — environmental and human. Both the habits of people and the forces of nature will wreak havoc on your fence. Using your lawn mower too close to your fence or constantly hitting it with a baseball with affect its structure. Moisture from rainfall can lead to mold, mildew, and rotting. The first level of protection for your fence is creating a barrier between its surface and these factors with paint or stain. Various types of paint can provide UV protection while keeping water from penetrating the wood underneath. Although painting and staining fences have similar processes, the result is quite different. As paint creates a layer on top of the wood, the stain is meant to soak into the wood. A stain is made from similar ingredients to paint as well, but usually much thinner and mixed with different proportions. When it comes to protecting the fence, because it soaks into the wood, it fills the pores which makes it impossible for water to take up residence there. Staining also allows the grain of the wood to stay visible if you’re going for a more natural looking fence. For either protection method to be successful, the fence must be adequately prepared before you begin. Preparation involves cleaning the fence and clearing all visible dirt, grass clippings, mold, mildew, dust, and other debris. You can choose to pressure wash it or sand it to create a smooth, even surface. You’ll also need to remove any remaining paint chips from a previous coat. After giving it time to dry from your cleaning efforts completely, then it’s ready to be protected for years to come. This entry was posted on Friday, February 16th, 2018 at 11:36 am. Both comments and pings are currently closed.